If you have been using Salesforce for a while, you have probably been faced with modifying Salesforce picklist values. This may seem like a simple task, but if not thought out properly, modifying salesforce picklist values can lead to complications down the road. Below are the options you have when replacing or deleting picklist values in Salesforce. If you just want to rename a value, click the “Edit” link next to the value and type in the new value. For instance, if you want to change the Lead Source value from Web to Web Page, edit the value and rename it. 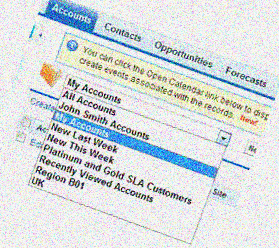 Some Salesforce picklists, like the Salesforce opportunity Stage, do not allow editing of the name and need to use one of the other options. Also, keep in mind that if you change the name of a picklist value, and that value is used in a Salesforce report filter, then that report may not work as expected after the change since that value will be removed from the filter criteria or if it is the only criteria, return an error when running/editing the report. Another option is to create a new value and then globally replace an existing value. This is handy when combining values or if you want to keep your report filters intact using new or existing values. When viewing the picklist values of a Salesforce field, use the “Replace” button and enter the value you want to replace. Then select the value to replace it with. You will need to have any new values added before replacing existing values. This is a global change and will replace the picklist value for all existing records, including records in the recycle bin. Also, this will update the Modified By date and time for all records where the value was replaced. When you use the “Del” link next to a picklist value, one of two things will happen. The value will either be removed from the picklist and is no longer selectable or you will be presented with a new screen to choose a value to replace the deleted value with. If you choose to replace the deleted value with “None” (the default), then existing records are not updated and the value is no longer selectable. Existing records will keep the deleted value until changed to a new value. Replacing the value follows the functionality above. Keep in mind that if you decide not to replace the value, it will still show up in reports and list views but you will not be able to use it in filters since it is no longer a valid picklist value. You can get around this by using the criteria of “Picklist Field” “not equal to” and then select all available picklist values. This will then return all records that do not have a valid (selectable) picklist value. Now that you understand the different options and ramifications of deleting, replacing, and modifying Salesforce picklist values, you can make the choice that best meets your needs. Would you like more best practices like this? StarrData is a Salesforce Partner that helps companies get more out of Salesforce. If you would like information on the services we offer call us at 510-761-5305.